Triple Tree Lodging is located 1 1/2 miles North of the Main Mt. Snow entrance on route 100. 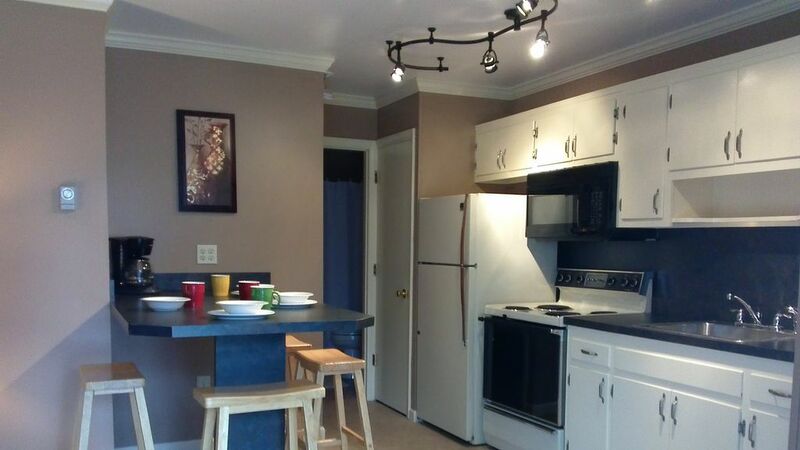 Our newly remodeled 2 bedroom, 1 bath, 1 level units can accommodate up to 4 people. These units have 1 Queen bedroom while the other has 2 twins. There is a full bath, kitchen and a living room with a gas fireplace. There is an eat-in bar in the kitchen with 5 stools, full refrigerator and stove with a range microwave. This place is very well kept and clean. Very cozy and everything you would need is here. Less than 10 minutes to great restaurants and bars and man, this place is just great!! Nice overall inside! Great location! Area to get in & out of condo was not cleared of snow! This is a great location for anyone planning a ski weekend at Mt. Snow. Right off Route 100, 5 minutes to the slopes and near to local places to eat. The apartment is very comfortable and roomy with a pleasant living area and well equipped kitchen. Check in and check out was painless and the office staff was very helpful. It was very cold and we had about 5 inches of snowfall but the apartment heated up to a comfortable level and the parking lot was plowed quickly. We would definitely stay again in the future. Only complaint is that the TV stopped working during the snowfall but the internet was good enough to watch the Super Bowl on our laptop. Triple Tree is a must if you staying in the Mount Snow/Stratton area! Updated and very clean wiith comfortable furniture and bedding. Kiichen has nice appliances and is well stocked with all you need to cook and serve all your meals. Hosts are great folks who make you feel at home. We have just booked another weekend. Thank you so much for your kind words about Triple Tree! We are so pleased that you liked the place. We certainly enjoy hosting to fine folks like you and your son! We appreciate your business and look forward to seeing you again during your next visit!